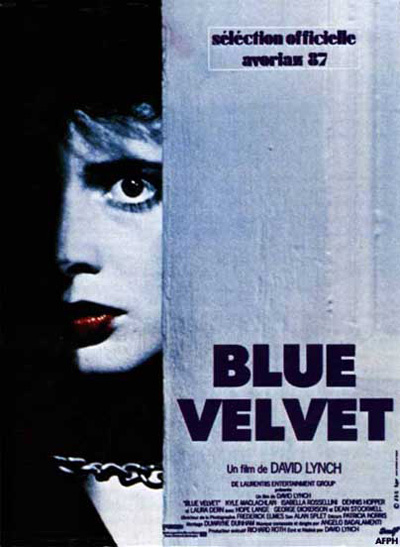 Blue Velvet is an example of the work of an artist with a singular vision at its best. Next only to the first season of Twin Peaks, Blue Velvet is David Lynch’s tightest, most dynamic, haunting and effective work. Still, it manages to be surprisingly unseen even by people who claim to be fans of Lynch’s work. As a girl I was obsessed with the movie long before I even saw it, I’d speculate about the plot based on the poster until my parents relented and let me watch it years later in my early teens. In this highly symbolic tale of the dark side of small town America, a remarkable cast (Isabella Rossellini, Dennis Hopper, Laura Dern, Dean Stockwell, Brad Dourif, and Jack Nance) acts out a disturbing melodrama turned on its ear (both figuratively and literally). Even with the deliberate pacing – and as those of you who have seen it can attest, everything about this film is deliberate: from the color of the hallways, the angle on the stairwells (only Lynch can create scary stairwells, see Laura Palmer’s house) to the hum and tone of the rooms – the action moves rapidly. It’s a wild ride, not unlike the joy ride a certain insane character demands. It’s a Lynchian film through and through and unlike anything else you’ve seen, though it’s not for everyone. I can’t quite believe I’ve failed to recommend it before now, but better late than never. And if you’ve seen it before, it only gets better with each subsequent viewing.